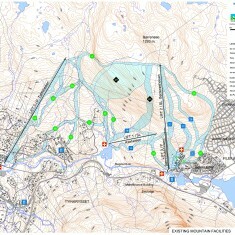 Tyin-Filefjell | Tyin-Filefjell | Ecosign Mountain Resort Planners Ltd. The Tyin-Filefjell area is approximately equidistant between Oslo and Bergen, at 265 kilometers; a drive of approximately 3.5 hours. The Tyin-Filefjell area has a long tradition as a summer holiday resort because of its proximity to the Tyin Lake and its function as the gateway to the Jotunheim countryside. Tourists travelled here as early as 1900 to experience the scenery. The Filefjell Skisenter currently operates four lifts, including two T-Bars and two platter lifts, as well as a short beginner lift. These lifts service 16 kilometers of pistes on approximately 500 hectares of terrain, located directly above the town of Tyinkrysset. 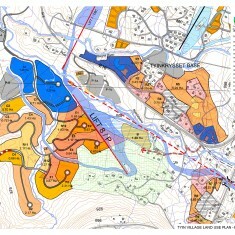 In July 2007, Ecosign was retained to work with the Tyin-Filefjell Skisenter, the Vang Kommune and a local stakeholders group to prepare a Resort Master Plan for Tyin-Filefjell. The Master Plan Study was carried out in a 3 phase process that involved ongoing consultation with the resort operator, the Kommune, a steering group of local landowners (the Styringsgruppe) and the public over a 4 year period. 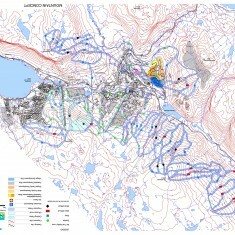 The first phase of the study involved a Technical Assessment of the existing ski facility and an evaluation of the suitability of the surrounding terrain for the development of a major, four-season mountain resort. Once the development potential was established, Ecosign prepared alternative Master Plan Concepts for full development of the area. These concepts were reviewed with the various stakeholders and eventually a preferred Master Plan Concept emerged. At completion of Phase 4 of the master plan, the total skier carrying capacity of the resort will be 16,000 skiers per day. Together with the existing development and development by others in the resort, the capacity of all accommodation in Tyin will be approximately 23, 260 beds at buildout.